I recently won tickets to see a different circus down in Providence. Then, I showed my wife a picture of an Old English Sheepdog performing at this circus. She's a bit of a sheepdog fanatic. We're still trying to figure out if she'd enjoy the show or want to go up and snuggle the dog. Is Boston local for you? If so, take a chance to win tickets to the show. You have until 4/17 to enter to win. Good luck. Big Apple Circus is a fantastic classical circus family experience. The organization itself has outreach programs in healthcare and communities across the nation. They use positive reinforcement for their animals and they do not condone animal abuse of any kind. They treat the animals as partners and care for them. Their circus truly happens under a "Big Top" adding more to the unique experience. Community Outreach programs include: Clown Care; Circus of the Senses; Circus After School; Vaudeville Caravan; and Circus For All. From now until May 11th - they are actually in my area - Boston Massachusetts! There are so many amazing shows to choose from - check out the full list HERE. Ticket prices vary based on seat type/location/date and time. This series is their all new LUMINOSITY show! April vacation - Spring break is coming up and this would be a great time to spend with the family. When planning your day - the show runs two hours with one intermission. LUMINOCITY —celebrate the vitality of life at the Crossroads of the World! Catch the high-spirits and pulse-racing thrills of the World’s Greatest Circus Artists in one ring under our Big Top, where no seat is more than 50 feet from ringside! Watch rowdy pups perform amazing tricks, double trapeze artists soaring high above, a bashful clown, an irrepressible flimflam man, and a juggler extraordinaire; teeter-board acrobats flying through the air, a cavalcade of magnificent steeds, and a couple of amazing wire-walkers suspended in mid-air. 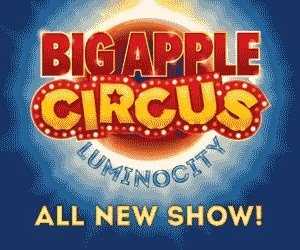 Right now you can enter to win a pair of tickets to the Big Apple Circus Luminosity Show in Boston MA! 18+, Continental US. One Entrant per household. Void where prohibited by law. Giveaway closes 4/17 at 11:59pm. I received one or more of the products or services mentioned above in the hope that I would mention it on my blog. I only recommend products or services I use personally and/or I believe would be helpful for my readers. I am disclosing this in accordance with the Federal Trade Commission’s 16 CFR, Part 255: “Guides Concerning the Use of Endorsements and Testimonials in Advertising.” The opinions expressed in this post are entirely my own. Your experience with the product(s) or service(s) may differ from mine.